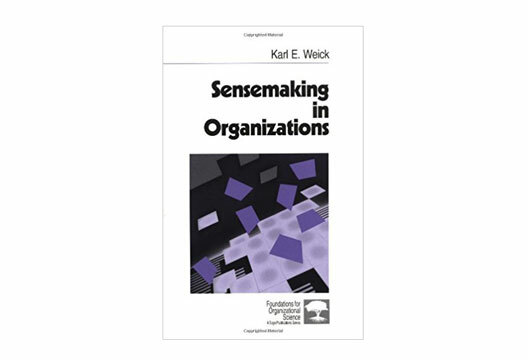 Anyone working in the field of organisational/occupational psychology will probably have heard of Karl Weick’s work on sensemaking – the core ideas on which are set out in his 1995 book Sensemaking in Organizations. The book is often described as more a ‘perspective’ or way of looking at the world than a theory or study. Why has it shaped me? Quite simply because it offers an innovative way of looking at fundamental properties of an ‘organising’ world never quite fully ‘organised’ – one that is messy, where actors do not always know what is going on until it has passed them by, always in motion across time and space. In this book, Weick combined important aspects of social and cognitive psychology to describe our processes of interpretation – how we struggle to ‘make things make sense’. How has it shaped me? Weick’s commitment to case studies and rich qualitative descriptions of people’s interpretations in crisis situations, organisational change efforts and high-performing teams reflect the best and worst organisations have to offer. They are a treasure trove of starting points for research topics, ideas and methods. The book also shaped me at a deeply personal level through the fundamental realisation that I am a sensemaking agent thrown into a confusing world. As a researcher and human being I am constantly acting and noticing and interpreting; trying to interpret my world into something more organised and plausible. I have drawn extensively on Weick in researching air crash disasters (Oliver, Calvard & Potočnik, 2017), big data in organisations (Calvard, 2016), and place and space in working lives (Calvard, 2015). I hope many other people will continue to be shaped by Weick’s book, and that the sensemaking perspective will continue to evolve – we must continue trying to make and improve the sense of it, after all. Calvard, T.S. (2015). Integrating organization studies and community psychology: A process model of an organizing sense of place in working lives. Journal of Community Psychology, 43(6), 654–686. Calvard, T.S. (2016). Big data, organizational learning, and sensemaking: Theorizing interpretive challenges under conditions of dynamic complexity. Management Learning, 47(1), 65–82. Oliver, N., Calvard, T.S. & Potočnik, K. (2017). Cognition, technology, and organizational limits: Lessons from the Air France 447 disaster. Organization Science, 28(4), 729–743.